– which we saw as great news for the Company, and furthered our opinion that Maudore’s continued success with their drilling program is adding value to a Company that has already discovered a high grade gold deposit (524,000 ounces at 20+ g/t) – in one of the very best gold jurisdictions in the world – with Val-d’Or to the south and Timmons/Kirkland Lake to the west. Therefore, we see this recent round of what we assume is some interim profit taking in the market by a few Maudore investors as a great opportunity to own Maudore shares at a nice discount to recent prices of over CAD$4 per share. One of Maudore’s largest investors , Anglo Pacific Group PLC out of London has also decided to add to their position lately as evidenced by the chart below, showing that they have accumulated an additional 114,100 shares (roughly $450K of stock) over the past couple of weeks. 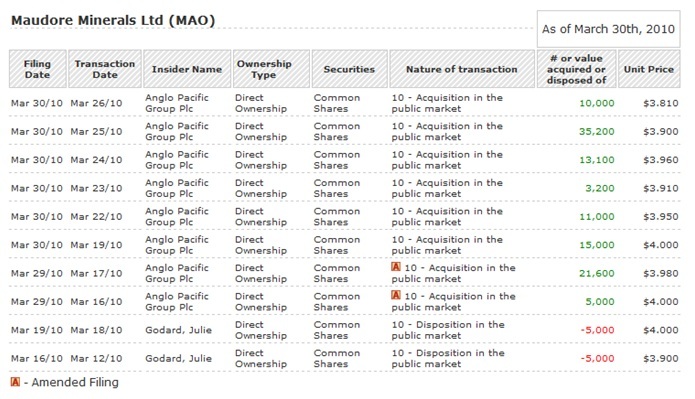 We have included a snapshot of the recent buying by Anglo Pacific Group PLC below. You can continue to track this by going to www.canadianinsider.com and putting MAO into the box on the right hand side. With four drills turning on the property 24/7 and the updated 43-101 report due out soon (Q2-2010) we are expecting good news flow from Maudore over the next few months and will continue to keep you informed as these events unfold. Maudore Minerals (TSX-V: MAO) reported more high grade gold drilling results from 13 holes, many with multiple intercepts, at the Company’s Comtois Project in Quebec. The current resource is along a roughly 2 kilometer strike length and new drilling results were obtained from areas along almost the entire trend. The Company is updating and upgrading a 43-101 compliant resource estimate at Comtois. The current inferred resource, 808,000 tonnes with 524,000 oz Au grading 20.2 g/t (uncut), was produced in 2002. According to Ron Shorr, Maudore’s CEO, the Company was targeting completion of a new resource estimate for the end of March this year, but in order to incorporate significant new data, the completion date has been deferred. In addition and as a result of persistent encouraging results, Maudore is continuing its aggressive drill program. Four high grade gold intercepts from one hole in the main Osborne area (Hole COM-09-326) ranged from about 8 g/t to 15 g/t Au. Three new holes near surface at the eastern side of the Osborne area intercepted approximately 8 g/t to 10 g/t Au. Hole COM-10-309 on the western Osborne fringe intercepted 21.6 g/t Au over 1.0 m.
Ten new significant gold intercepts were obtained in the Midway area at different depths: near surface, around 150-300m and around 450m, including 21.2 g/t Au over 1.0 m (COM-10-324), 19.2 g/t Au over 1.0 m (COM-10-307) and 18.9 g/t Au over 0.8 m (COM-10-320). COM 09-300 returned multiple high grade intercepts from 295 to 493 meters including 36.7 g/t Au over 1.5 m within 12.0 g/t Au over 7.5 m.
Maudore Minerals (TSX-V: MAO) has elected Ron Shorr to the position of Chairman of the Board. Prior to taking on the role of Chairman, Mr. Shorr was the Company’s President and Chief Executive Officer. He will continue as the Company’s CEO, but not as its President, thereby clearing the way for the Company to further expand the management team. Over the last 12 months, we descended into the Earth’s core more than 450 metres on a mine visit in Mexico, we attended most of the major North American mining conferences, we’ve spoken with most of the leading industry experts, and we’ve studied the precious and base metals markets to no end. And we do that, in part because we love it, and in part for the benefit of our BabyBulls’ subscribers. With that said, we have identified our next fully profiled company. And with gold down from its high, but poised for future growth, we thought it was an opportune time to introduce you to Maudore Minerals Ltd (TSX-V: MAO), a gold company engaged in the exploration and development of its 100% owned Comtois Property. Comtois is a high grade gold property with an inferred mineral resource of 808,000 tonnes at 20.2 g/t gold or 524,000 ounces of gold based on only 66 drill holes. As impressive as that is, the Company has now drilled more than 340 holes, the results of which will be incorporated in an updated resource estimate due this spring. Location, Location, Location – Comtois is located in the Abitibi Greenstone belt of Quebec, Canada, which in terms of gold production is second only to that of Witwatersrand, South Africa. Quebec offers a politically and economically stable environment and a mining friendly attitude, including exploration cash rebates of nearly 50% of exploration expenditures. Aggressive Drill Program (and the cash to execute it) – Maudore has a well-managed balance sheet with recent cash on hand of approximately $8 million. On top of the soon to be released updated resoure report, the Company is in the midst of an aggressive drill program with 4 drill rigs at work. Got Gold? – Gold is off its recent high but seems to have support at the $1,100 level and most analysts and experts continue to predict that gold will eclipse the $1,300 to $1,500 mark in 2010. For additional information about Maudore Minerals, please visit us at www.babybulls.com or visit the Company’s Website at www.maudore.com. Want to read more exclusive material from BabyBulls? Sign up for our free e-newsletter, and you’ll learn when new articles have been published. To see a list of recent interviews with industry analysts and commentators, visit our blog page at BabyBullTwits. You are currently browsing the archives for the Maudore category.